Do you cook at home? If so, how many times a week? Chances are, your answer will vary depending on whether or not you work outside the home, your age, and your income. Sure, cooking at home can save you plenty of money, but not a lot of us do it. According to Harris Interactive, “Two in five (41%) say they prepare meals at home five or more times a week and three in ten (29%) do so three to four times a week. One in five (19%) of U.S. adults prepare meals at home one to two times a week, and 11% say they rarely or never prepare meals at home.” There aren’t always easy ways to get a home cooked meal on the table. In the last several years, my husband and I have made the switch to exclusively eating at home. We go out to eat less than 10 times a year, usually only when we’re traveling. What I’ve discovered is that cooking at home can actually be A LOT of work. Making healthy, low-cost food requires time and energy, and then there is all of the clean up to do afterwards. If I were still working full-time outside the home, I doubt that I would have time to cook as much as I do now. 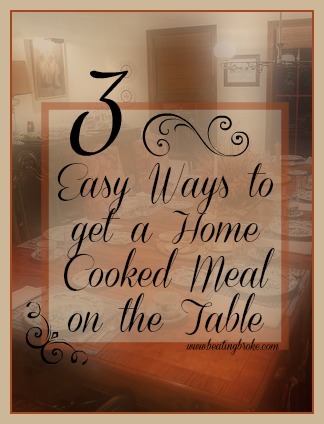 However, there are a number of strategies that can help make preparing foods at home easier. Have a go to meal. Everyone should have a few easy meals that they can make from staples in the pantry when they’re short on time. Choices might include spaghetti, cheese quesadillas, grilled cheese sandwiches, etc. These meals may not be ideal nutritionally, but they’re still better than grabbing fast food, and they’ll save your wallet. Use your slow cooker. Start the slow cooker in the morning, and when you come home, you’ll have a hot meal waiting for you. To save even more time, prep all of the ingredients the night before so in the busy morning, you can just dump in the ingredients and go. Utilize freezer cooking. Take one day a month and cook up several meals for your family for the month. This might take you three to four hours, but then you will eliminate much of the cooking you’ll need to do for the rest of the month. Simply take a meal out of your freezer the night before you need it and then reheat it when you get home from work. There are short cuts to freezer meals, too. Search Pinterest, and you’ll find crockpot freezer meals. Simply dump the ingredients in a freezer bag and freeze. This type of freezer cooking doesn’t require any cooking before putting it in the slow cooker, so you can make a month’s worth of meals in about an hour. Another idea is to double any recipe you are already cooking and put the second one in the freezer for a busy night. Don’t be discouraged if you haven’t yet mastered how to eat at home without spending all of your time cooking. As Marion Nestle, professor of food studies at New York University and author of What to Eat says, “Anything that you do that’s not fast food is terrific; cooking once a week is far better than not cooking at all. It’s the same argument as exercise: more is better than less and some is better than none” (The New York Times). What is your favorite strategy to get a healthy meal on the table quickly? Are you familiar with the USDA food plans? These plans state how much food should cost a family each month based on four categories: thrifty, low-cost, moderate and liberal. The plans are updated each month to accommodate food price increases. You determine how much your family should spend by choosing one of the four plans, and choosing the ages and members of your family. Recently, I voluntarily decided to cut back on my freelance workload so that I could spend more time homeschooling my kids. We decided to tighten our belt and live off my husband’s income alone while banking the money I’m making. I also found organic potatoes 5 pounds for $2, so I bought 40 pounds. Same for cabbage at 33 cents a pound. I bought 6 heads. Inevitably, there are weeks where there are no good sales, so we eat from the pantry. This week is one of those weeks, so we will be eating a lot of meals with cabbage and potatoes. Make your menu plan based on the items that are on sale. I’ve always made a menu plan. (If you don’t, start now! It’s such a money saver.) However, I made my menu plan first and then went shopping. Now, I do the opposite. I find out what is on sale, and I make my menu plan based on those items. Make freezer meals based on low cost items. When I have extra time or extra groceries, I make freezer meals. Then, if there’s a week where we’ve run out of grocery money or there’s nothing good on sale, I have at least a week’s worth of meals in the freezer. Be disciplined when going to big box stores. I love shopping at Costco, but I’m very careful to only buy what is on my list. I can get organic carrots 10 pounds for $6.99. I can buy a 2 pound bag of organic greens for less than $5. These prices can’t be beat! However, if I stray from my list and spend on impulse buys, I’m not saving any money. What USDA plan is your weekly grocery spending closest to? 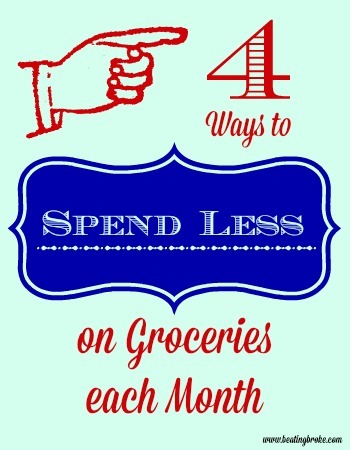 What other tips do you have to save money on groceries? Have We Lost the Meaning of Frugality? My grandparents were married during the Great Depression. Their first few years together were spent in severe economic hardship, and the financial lessons they learned during that lean time never left them. They always had one car. My grandma wore the same dresses throughout my entire lifetime. I think when she died, the dresses she still had were 25 to 30 years old. They rarely went out to eat, opting instead to cook and eat simple meals at home. My grandparents did without much of the time, and they were very frugal with their money. They sold their house when they retired and lived in a 5th wheel trailer parked on the side of our lot, less than 20 steps from our house. All of their possessions fit in that space, and their home was not cluttered. 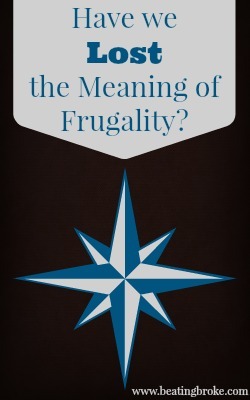 Has the Meaning of Frugality Changed? Now, the definition of frugal seems to be different. People try hard to avoid doing without. Now, the motto seems to be, “Why do without?” Live like the Jones’ without spending money like the Jones’. Whereas my grandparents carefully bought the groceries they needed, today’s frugal zealots clip coupons and create grocery storage spaces out of their garages. They have rows and rows of processed food that they got for pennies on the dollar thanks to couponing. Many mom bloggers are making their fortune sharing all the hottest deals available. Kids’ winter jackets for $8! Hurry, buy women’s turtlenecks for $4 today only! Get your child the Barbie princess house for the low price of $48! Hurry! Hurry! Buy the bargain. Do You Really Need That Bargain? So many consumers are on the hunt for a good deal that they never stop to ask themselves if they really need the item that is on sale. What if your child doesn’t need the Barbie princess house? What if your child has so many toys, she whines about picking them up and doesn’t take care of the ones she has? Is that Barbie princess house still a good deal? What if you never even thought about buying that item until you saw it on sale and didn’t want to miss out on the savings? Look back at pictures of people’s homes from 60 or 70 years ago. Their homes were not cluttered. They were much more like the minimalists’ homes of today. Now, we take advantage of so many “deals” that our homes are overflowing. Here in Arizona where there are no basements, and therefore no built in storage, most people can’t park in their garages because they’re stuffed with possessions. We don’t need all of this stuff. Snagging a great deal on something we don’t need isn’t a deal. We’re entering into the busiest shopping season of the year. There will be good deals, plenty of them. You’ll likely be tempted to buy as many gifts for yourself as you will for others. After all, the prices are so good. But ask yourself one simple question–Do I need it? If you don’t, it’s not a deal. Do you think the definition of frugality has changed? Do you or someone you know struggle with buying more than you need because something is on sale?